Nijmegen (German, Nimwegen) is a city in the Dutch province of Gelderland, which in 1951 had a population of 112,800 (231 Mennonites). The first mention of Anabaptists in this city occurs in 1539; on 19 April of that year three unnamed Anabaptist men were burned at the stake here, and shortly after that two women were drowned in the Waal River. Two other victims of persecution in this city are known: in 1557 (van Braght gives the year as 1556) Gerrit Hazenpoet was burned at the stake, and in 1569 (van Braght 1572) Jan (Johan) Block met the same fate. But the city government did not always take such strong action against the Anabaptists; as early as 1565 Jan van den Berg was expelled from the city with his whole family because he refused to have his children baptized. The next mention of Anabaptists is made in 1639. The city, which had become predominantly Reformed, suffered a terrible epidemic of the plague in 1635-1637, losing about half of its inhabitants. It therefore considered bringing weavers in from other places for its linen weaving industry. During this time many Reformed came here from the duchy of Jülich, Germany, where they were oppressed because of their religious faith. Mennonites came too; in 1639 a Mennonite acquired the rights of citizenship, and two others in 1640. Instead of giving the customary oath they were received upon their vow of truthfulness ("by mannen-waerheyd"). In 1642 and the following years more Mennonite weavers came to Nijmegen from Jülich, who practiced their craft, becoming citizens in the same way. The number of Mennonites there in 1652 was considerable. The complaint of the Reformed to the government that the Mennonites were meeting regularly for services indicates that there was an organized congregation. In 1654-1657 new refugees came, strengthening the congregation, which Guyot estimates at 180 souls. The Mennonites of Nijmegen belonged to the United Flemish, Frisians, and High Germans and used this name although there were never any divisions there. After the Lamist-Zonist schism the Nijmegen congregation held to the conservative Zonist views. In 1664 Willem Kops, Jan Welsinck, and Pieter Willemsz signed the Verbondt van Eenigheydt in the name of the Nijmegen congregation. A man of importance who did much to promote the financial status of the brotherhood was the deacon Jan Godschalks van Elten (d. 1700), who came from München-Gladbach, Jülich, and obtained citizenship in 1655. In 1665 the council of the Reformed Church protested that the Mennonites had a fixed place of meeting; thereupon they were forced again to meet in the homes of the members. In 1706 they bought a house which they remodeled as a church. 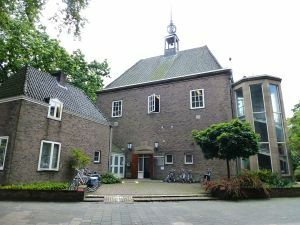 In 1728 they found another place in the Remonstrant church on the Arminiaansche Plaats, which was now sold to the Mennonites. In the 18th century the membership suffered a sharp decline. In 1655 the membership, including children, was estimated at 180. The number of baptized members in 1783 was 99, in 1798, 39, and in 1847 only 28. The French occupation brought a time of trial and difficulty. In 1794 the church was used as a stable. But by 1802 it was again in use as a church. After 1860 the membership increased rapidly. The 28 members of 1847 grew to 240 by 1900. In 1940 the membership stood at about 200, in 1955 at 135. The congregation of Nijmegen seems to have had as its first regular (lay) preacher and elder Thomas Ameldonck, who came from Goch and served at Nijmegen 1672-1689. After he died the congregation was for some time served by elders from the outside, but in 1690 two preachers had been appointed, i.e., Jan Ameldonck Leeuw, the son of elder Thomas Ameldonck, and Laurens Hendriks. They were followed by Hendrik Laurens (son of Laurens Hendriks) and Pieter Hendriks (Pieter de Eger, or van Egen), who were both appointed elders in 1724. Laurens Hendriks served until 1759, in which year he retired; Pieter van Egen served until his death in 1770. They were followed by Cornelis Bruyn, serving 1773-1782, J. H. Floh, who was their first minister trained at the Amsterdam Seminary, 1782-1783, Evert Akkeringa 1784-1799, Herman I. van Hinte 1799, Abraham de Vries 1800-1801, Pieter Hollenberg 1801-1805, Sybren Sybrandi 1805-1807, Coenraad Bavink 1807-1810, Anthonie Doyer 1811-1818, Cornelis S. van Geuns 1819-1822, Abraham Doyer 1825-1828, Jan Boeke 1828-1830, Klaas Sybrandi 1830-1834, J. ten Cate Fennema 1835-1860, J. Attema 1861-1881, P. Feenstra Jr. 1881-1891, B. Haga 1891-1917, Y. S. Buruma 1917-1950, H. C. Valeton 1950- . During World War II the church was destroyed in September 1944; a new church was dedicated on 25 May 1952. In the 1950s there was a Sunday school for children and a ladies' circle. The city by the mid-1950s was predominantly (79 per cent) Catholic. Algemeen Doopsgezind Weekblad 11 (1955): 36, 40. Doopsgezinde Bijdragen (1874): 1-33; (1875): 67-92. Guyot, P. C. G. Bijdragen tot de geschiedenis der Doopsgezinden te Nijmegen (1845). Haga, B. De Doopsgezinde Martelaren te Nijmegen (Geschriften t. b. v. de Doopsgezinde in de verstrooiing). Amsterdam, n.d. Hoop Scheffer, Jacob Gijsbert de. Inventaris der Archiefstukken berustende bij de Vereenigde Doopsgezinde Gemeente to Amsterdam, 2 vols. Amsterdam: Uitgegeven en ten geschenke aangeboden door den Kerkeraad dier Gemeente, 1883-1884: v. I, Nos, 1261, 1772; v. II, Nos. 2154-74. Zijpp, Nanne van der. "Nijmegen (Gelderland, Netherlands)." Global Anabaptist Mennonite Encyclopedia Online. 1957. Web. 21 Apr 2019. http://gameo.org/index.php?title=Nijmegen_(Gelderland,_Netherlands)&oldid=125752. Zijpp, Nanne van der. (1957). Nijmegen (Gelderland, Netherlands). Global Anabaptist Mennonite Encyclopedia Online. Retrieved 21 April 2019, from http://gameo.org/index.php?title=Nijmegen_(Gelderland,_Netherlands)&oldid=125752. Adapted by permission of Herald Press, Harrisonburg, Virginia, from Mennonite Encyclopedia, Vol. 3, pp. 879-880. All rights reserved. This page was last modified on 7 October 2014, at 05:36.